In the 1970s, Biman Mullick was teaching at an art school in England when he became concerned about the dangers of passive smoking. At the time, smoking indoors was commonplace and almost half (45%) of the UK’s adult population were cigarette smokers. Doctors had already established a link between smoking and lung cancer but little was known about the consequences of inhaling second-hand smoke. 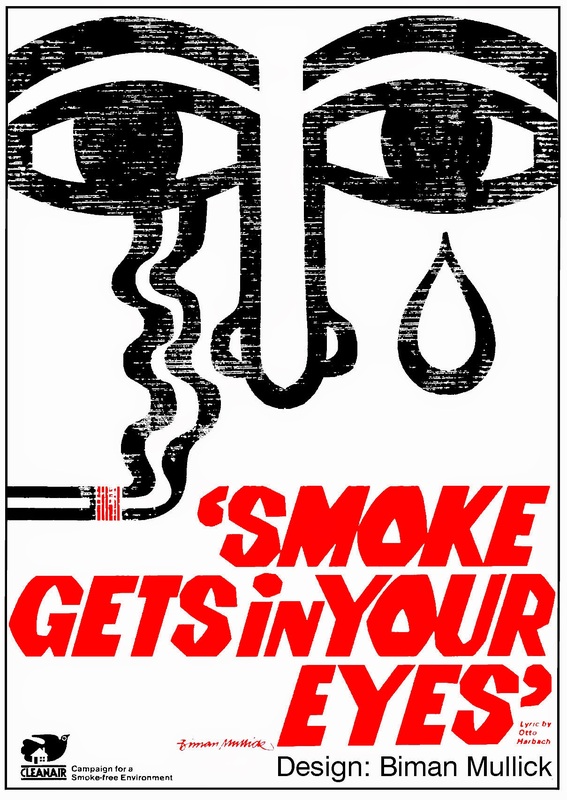 Mullick was not a smoker but became concerned that if smoking was bad for you, then passive smoking might be too – so he created a set of posters asking students not to light up in his classrooms. He printed them out in black and white and put them up around the college but was quickly asked to remove them by the prinicipal. “There was no law against smoking in the classroom … and he said that smoking was a part of British culture,” says Mullick. Mullick believes that creating these posters cost him his job – he wasn’t sacked, but the college later declined to renew his visiting lecturer’s contract. 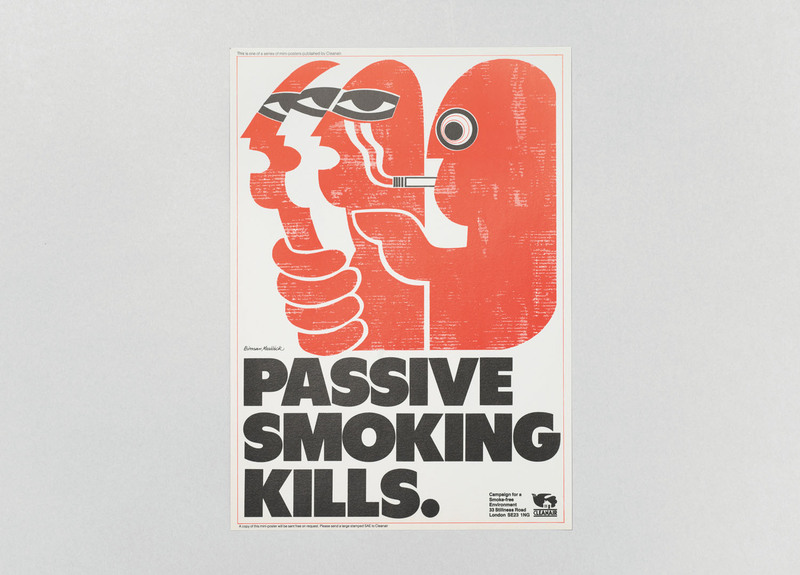 Undeterred, he began designing more posters and set up Cleanair, an organisation devoted to campaigning for a smoke-free environment and raising awareness of the health risks associated with smoking. He sent his posters to newspapers and public health authorities, who immediately took notice. “Health operatives had started noticing that smoking should not be permitted in hospitals and health buildings, and they started buying my posters,” explains Mullick. Within a few years, his posters were in use throughout the country and by 1984, he had distributed 186,000 of them. Most were distributed in hospitals, schools and colleges. They also appeared in the background in several TV shows. Mullick’s designs are striking: the influence of Indian visual culture is evident in his work and his posters combine bold colours with hard-hitting phrases and playful illustrations. 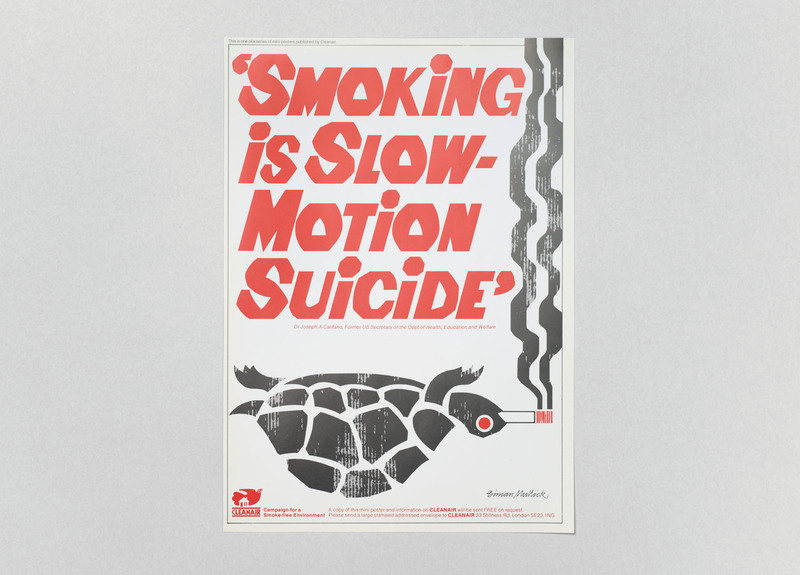 One reads ‘smoking is slow motion suicide’ and features an image of a deceased turtle with a cigarette in its mouth while another warns that ‘passive smoking kills’. As well as persuading people not to smoke, Mullick says he wanted to raise awareness of the impact of tobacco consumption on the environment (as tobacco consumption rose, so did deforestation). 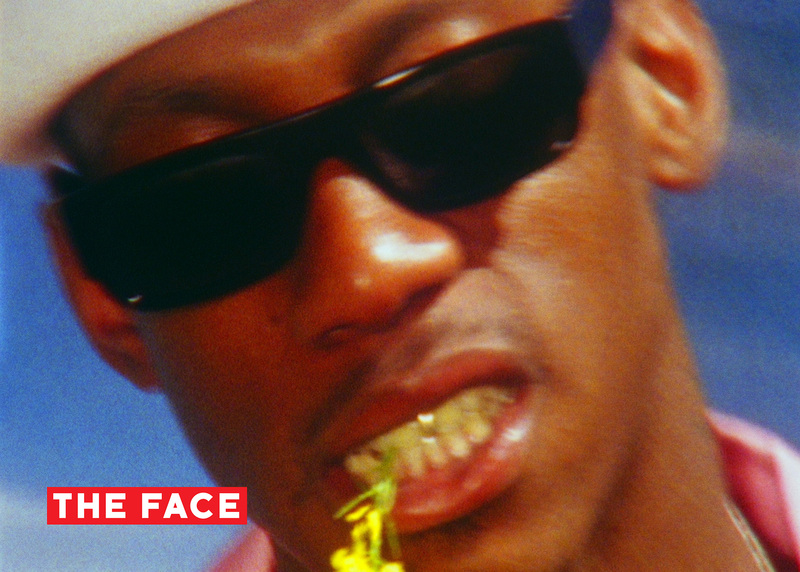 His campaign was controversial. Mullick says people often disputed the idea that passive smoking was harmful – “in those days, it was quite radical thinking,” he says. 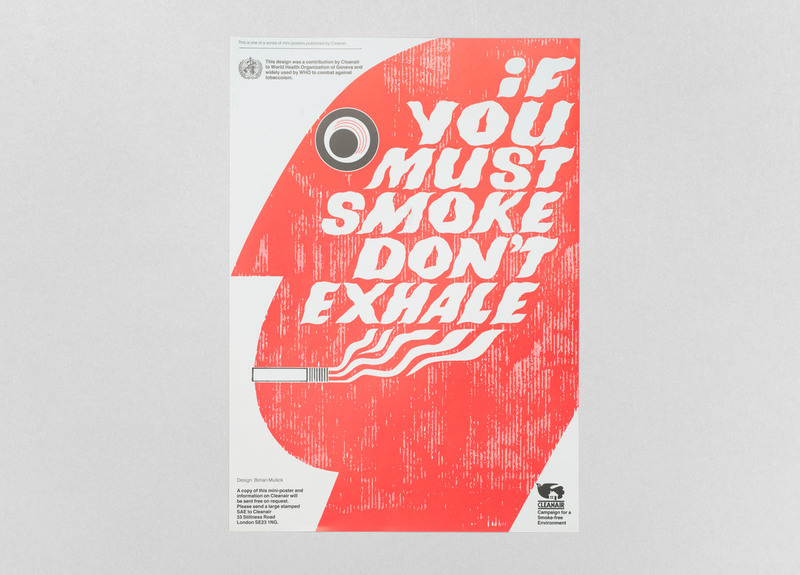 The government was also reluctant to introduce a ban on smoking in public buildings and Mullick was often told that it was people’s right to smoke indoors – but he continued to produce anti-smoking posters at his own cost and sell them on to institutions. 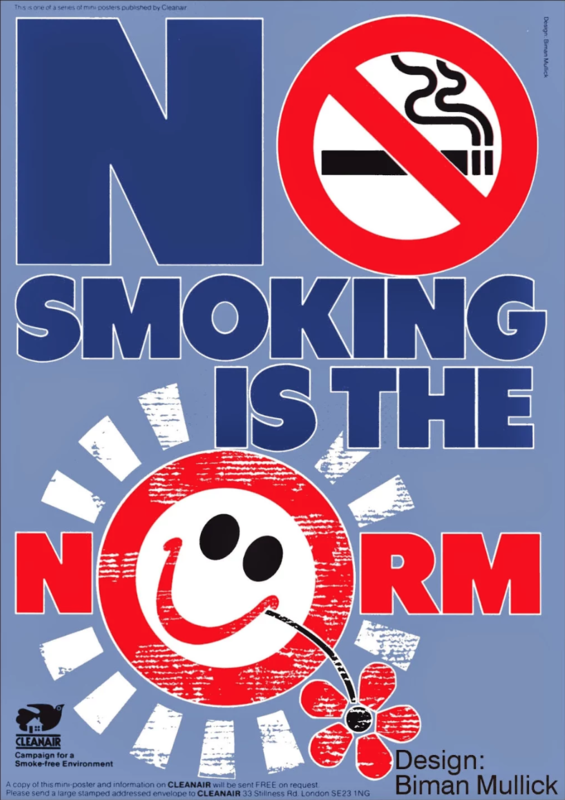 In 1988, he received a medal from the World Health Organisation for creating posters that “politely, strongly and humorously deliver the message that non-smoking is the norm”. 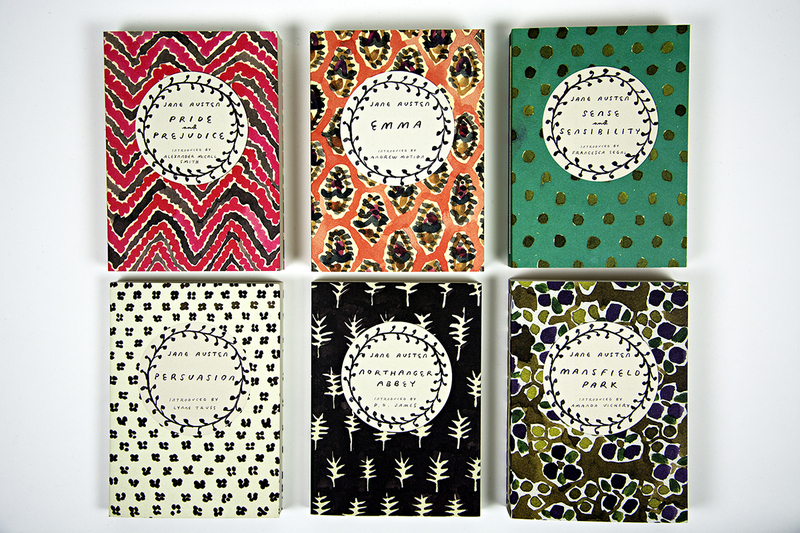 His work was also featured in an exhibition at the Design Museum. Mullick continued campaigning throughout the nineties but gave up after the introduction of the 2006 Health Act which banned smoking in public buildings in the UK. He has no idea whether his posters convinced people to give up but hopes that they might have at least made people think twice. The number of people smoking has dropped dramatically since the 1970s and it is no longer permitted indoors but Mullick believes there is still work to be done. He would like to see a complete ban on smoking in public (encompassing outdoors as well as inside) and has listed 12 recommendations for creating a smoke-free society on his website. Now in his 80s, he has devoted much of his life to campaigning for a smoke-free environment and it remains a cause that is close to his heart. 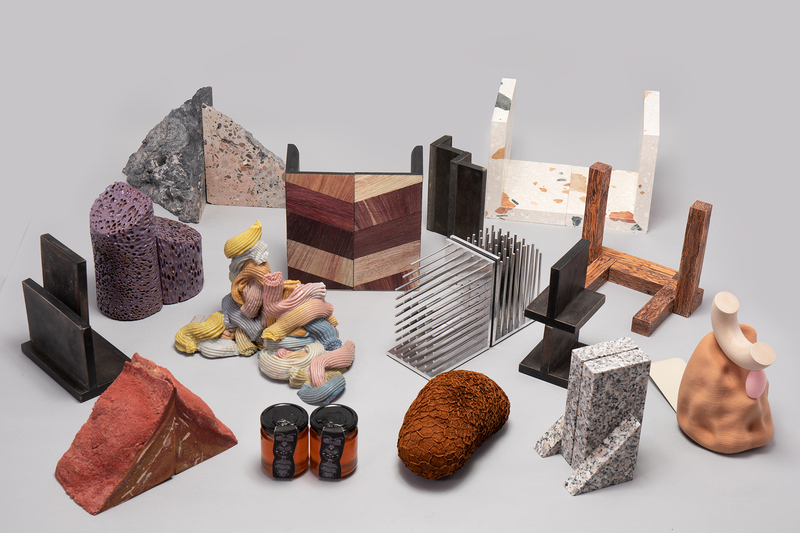 His work will soon be featured in Can Graphic Design Save Your Life – a Wellcome Collection exhibition curated by GraphicDesign& and the Wellcome’s Sharmita Sharmacharja. The exhibition explores the role of graphic design in healthcare and includes 200 items dating from the 18th century to the present. Mullick’s work is one of a number of smoking-related projects in the exhibition – others include seductive cigarette packaging and anti-smoking stamps – and shows how graphic design can be used to persuade, change behaviour and communicate important messages. “One picture is worth a thousand words … and the power of pictures should not be ignored,” he adds.